Cruise Into Terror is a masterclass on the importance of a man keeping his woman satisfied in the bedroom. 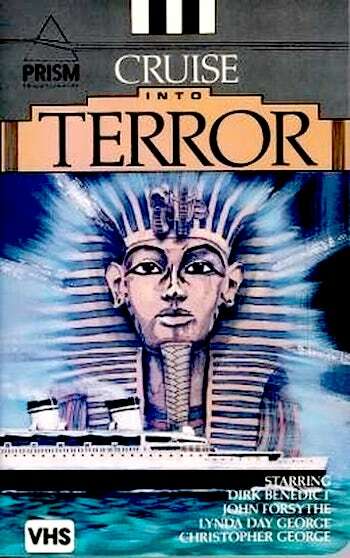 Ostensibly about a lost Egyptian tomb in the Gulf of Mexico (don’t ask – it was the 70s! ), the film ably depicts the terrible things that can happen when a neglected woman is forced to copulate with the Antichrist’s babysitter! 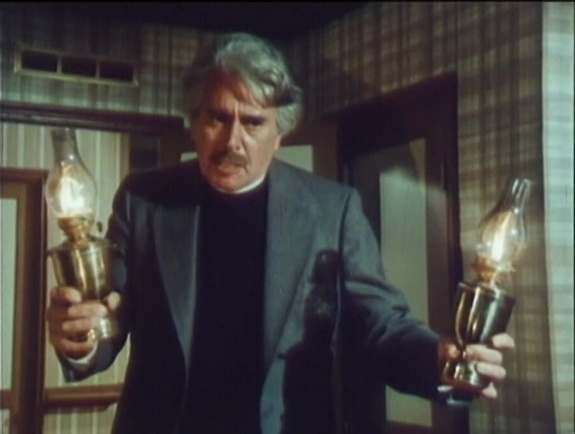 Reverend Mather (John Forsyth sporting a mustache that appears to be attempting to channel Omar Sharif) is obsessed with being redeemed for his years of seeking solace in the bottle. But what about his much put upon mate, Lil? First taking a backseat to her husband’s alcoholism and then to his religionism, it is understandable that Lil puts him on blast about needing to be caressed and made love to, even if it did come right in the middle of her husband battling Satan for the very fate of all existence. Sure, it’s the End Times and all that, but I have needs too! I think even the Reverend could understand her stepping out for a few nameless one night stands, or even a short term affair with a co-worker or parishioner. I mean we’re all adults here, right? But damn, Lil, did you have scuttle down the hall and drop your unflattering cotton nightgown for the only dude on board the ship that literally has no soul and is pledged to raising the son of Satan until he’s old enough to properly unleash hell on Earth? 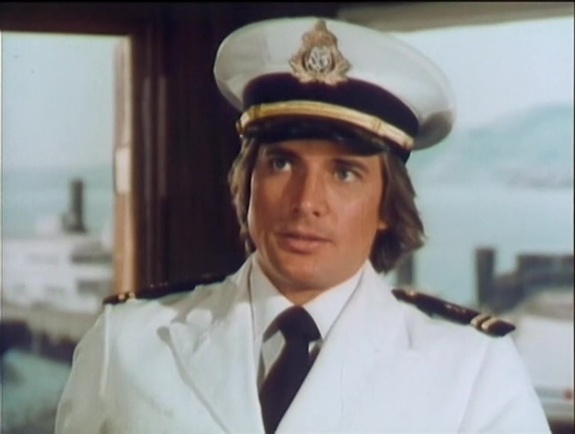 For crying out loud, Dirk Benedict (Battlestar Galactica, The A-Team), was also on board the ship! Just goes to show you can’t underestimate how powerful the Devil truly is! But Old Scratch ain’t just seducing our frustrated middle age babes! He’s also cockblocking awesome business deals! Neal Berry (Christopher George of City of the Living Dead) is a broker obsessed with making money and his wife is another Debby Downer who moans about how he cares more about his work than her. A cruise is just what they need to reconnect and after Neal has some drinks and notices the younger gals on the cruise cavorting around in their bikinis, he finally begins to unwind. Until the ancient Egyptian sarcophagus is hauled up from the ocean! It’s solid gold and worth millions! Once he gets it back to the United States, he and the rest of the passengers involved in its recovery are going to cash in big time! But the Reverend is convinced that Satan’s little boy is inside and wants to chuck it overboard. Neal smartly makes a deal with the passenger who is also the soulless guardian to keep watch over the tiny coffin to make sure nobody does anything crazy and gets rid of it. Hey Reverend, save the world on your own dime! Chump! Neal’s wife (played by real life Linda Day George – you can see them together in several films including the hacktastic Pieces), immediately gets in his face about how he only cares about getting paid for the sarcophagus. She just wanted them to be happy, you see! In an effort to show her what happy is, he pushes her down on the bed and the scene ends without further comment on what might have followed. Later though Dirk hits him in the head with a wrench snapping him out of his gold/wife beating fever and he says he’s sorry. Marriage – 1, Devil – 0! Captain Andrews (Hugh O’Brian, so macho that even as he is trying to quit smoking, he’s actually always smoking in between surly scowls and picking up Stella Stevens for a personal tour of the captain’s quarters. And you damn sure can bet he’s smoking a heater while laying in bed after crossing her equator!) is forced to take a half broken down boat and about 9 passengers to Mexico where they’ll meet up with a cruise ship to transfer them. Almost immediately after sending him on this suicide mission, his boss is killed in a mysterious forklift accident on shore at the office thus necessitating resetting the “Days Since Last Death By Hell’s Disciple” counter to zero. Ray Milland (Frogs) is the archeologist on board who explains how he found information in Egypt that says the Egyptians built a tomb in Mexico. And then the ship breaks down right on top of it! 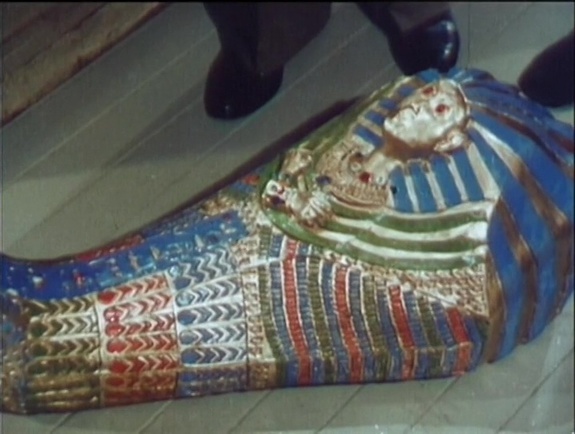 Everything comes to a fiery and explosive climax resulting in some deaths and a final shot of the sarcophagus somehow back in the ocean, unharmed and still breathing! I will leave it to the astute observer of current events as to whether Satan ultimately succeeded in his plan, but you don’t even have to be barely astute to know that Cruise Into Terror succeeded in its plan to be the most Seventies TV-movie of all time. Even Christians, Satanists, Atheists, and horny sea captains with early stage lung cancer can at least agree on that!